The sixth book in the thrilling, action-packed, New York Times best-selling I Am Number Four series. There is still hope. When the Elders sent the Garde to Earth, they had a plan - one the Garde are finally starting to understand. In the climax of The Revenge of Seven, a group of the Garde traveled to an ancient pyramid in Mexico known to their people as the Sanctuary. There they awoke a power that had been hidden within our planet for generations. Now this power can save the world...or destroy it. It will all depend on who wields it. ARGH! so frustrating that there is another interminable wait for the next book. This series just keeps getting better. I can't believe it!!! I've never read a series like this and it's just incredible!!! also number 9 should have gotten a chapter describing his fight with 5 in new York. really the author should have added more dialogue for number 9. he is the only character that offers comic relief and the story really needed more of that. When is this series going to end? When this series came out, I could not get enough of it. He could have wrapped this series up with this book. But NO! another cliff hanger and to be honest, I'm not sure I am going to carry on with this series. 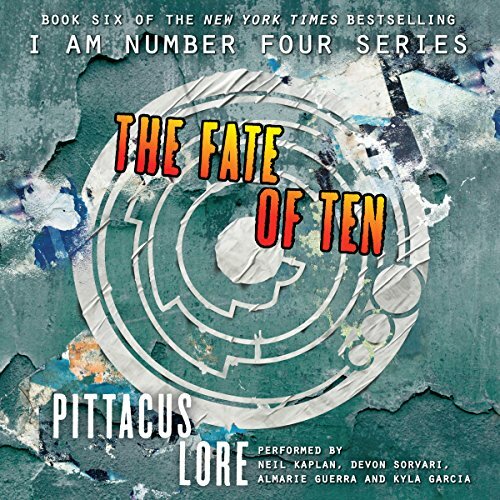 Lots of expected action between the Loriens and Mogadorians with a few new twists heading up to big confrontation in the end but I can't say I was particularly impressed nor particularly interested in listening any further unless this series comes to an end in the next book. Well...that was awesome, even better though - the story isn't over! I thought this book was gonna be it but it obviously is not. The story was great...the only thing that threw me was the voice narration for John...it seemed very different this go around? At first, I didn't like it as you become accustomed to what a characters narrator sounds like. Eventually though, you get used to the difference and it isn't an issue. As with all the other books, great story and high anticipation for what comes next. I hope we see one of the "lost files" type books pop up to satiate everyone until book 7 is released...let the countdown timer begin! Well done really good story with a surprise sad twist at the end I look forward to the next book in the series. I feel like I just ran a marathon. I am glad that before I read this book I also read the lost files. it really filled in a lot of the new characters here. no spoiler alerts here but the ending really leave you hanging. Non-stop action leaving me wishing for more. can't wait for the last one. I was really bored with this series after the last book. It seemed so predictable and like the characters spent their time sitting around. This was everything that one wasn't; lots of action. Illogical, simple black and white story, bad style, bad speakers (in particular that of John), unbearable shallow dialogs. Lowbrow SciFi.